LG and Samsung will unveil 105in Ultra HD 4K curved TVs at CES 2014 | What Hi-Fi? And so it begins. The battle for supremacy at the forthcoming CES 2014 has resulted in both LG and Samsung today claiming they will unveil the "world's first" 105in curved 4K Ultra HD TVs in Las Vegas. LG has today confirmed that it will unveil a monster 105in curved Ultra HD television at CES 2014 (shown above), and in doing so, has claimed it is the world's first 21:9 ratio 4K model and the "largest curved TV ever made". Samsung has made a similar claim about its version (below), which like the LG uses LED/LCD rather than OLED display technology. Like the Samsung, the LG 105UB9 will offer a 21:9 CinemaScope screen, which it says provides the optimum screen ratio for viewing 2:35 aspect ratio films, without showing top and bottom letterbox bars. LG has also said that the sheer size of the screen will mean additional information can be viewed at the sides, without interrupting the on-going action in the middle. The 105UB9 will have a 5120x2160 resolution, which equates to 11 million pixels. Current 4K Ultra HD TVs have around eight million pixels. 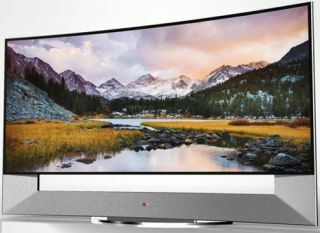 LG also claims that even though the giant 105in TV has a curve, it won't result in poor viewing angles which other curved TVs can suffer from. This is because LG Display has tinkered with the Thin Film Transistor (TFT), to prevent colour leakage. Details as to whether either TV will become publically available have yet to be released - athough finding space for the giant screens will no doubt prove problematic for most. For now the LG 105UB9 will only be on display at the LG booth at CES 2014 and the Samsung similarly on its stand.